I am Takashi Sano from the capital city of Japan. Do you know which city I’m speaking of? I am co-Chief Scientist on this expedition. 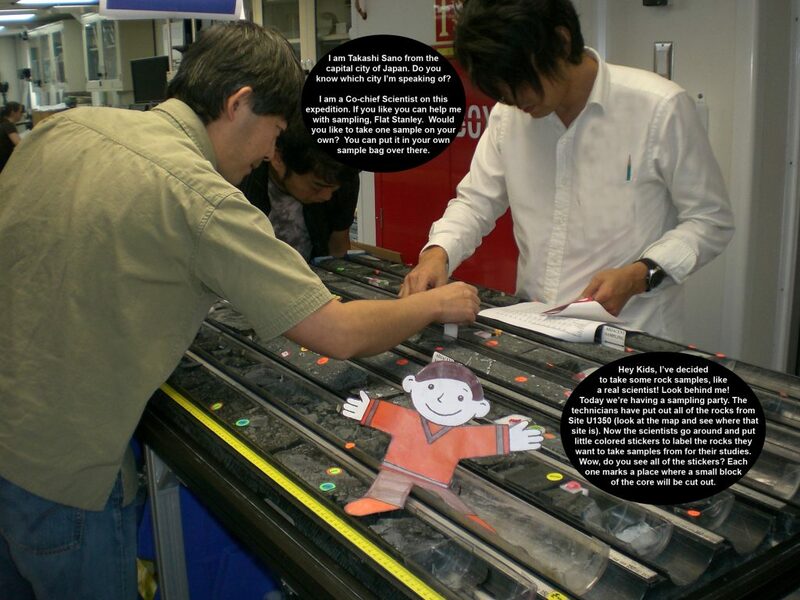 If you like you can help me with sampling, Flat Stanley. Would you like to take one sample on your own? You can put it in your own sample bag over there. Hey kids, I’ve decided to take some rock samples, like a real scientist! Look behind me! Today we’re having a sampling party. The technicians have put out all of the rocks from Site U1350 (look at the map and see where that site is). Now the scientists go around and put little colored stickers to label the rocks they want to take samples from for their studies. Wow, do you see all of the stickers? Each one marks a place where a small block of the core will be cut out.